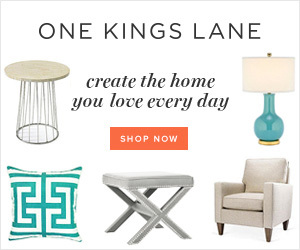 Hi friends, and welcome back for another Styled + Set Entertaining Tour hosted by my friend Lory of Designthusiasm!! And a double welcome if you are coming over from my other dear, sweet friend, Lidy of French Garden House. 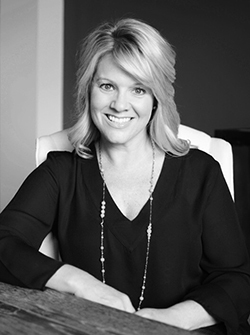 I love Lidy’s tip filled blog and am so glad you are coming over from her beautiful spot in the blogosphere! 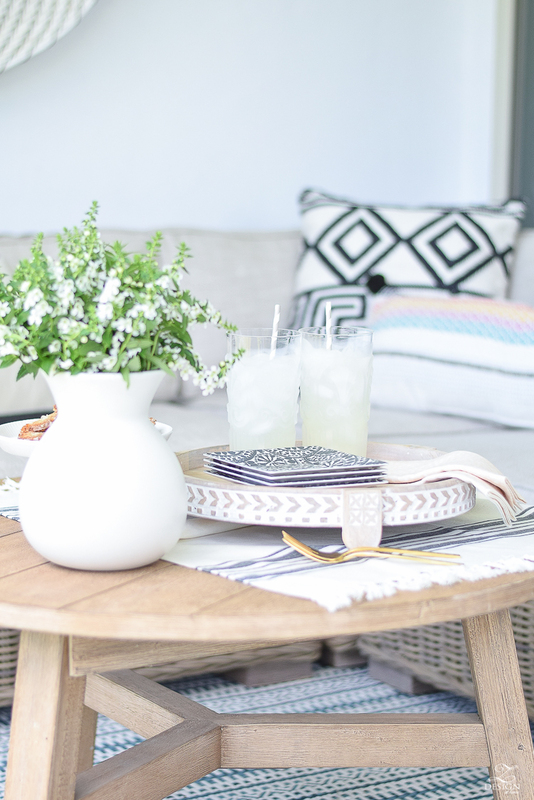 I love summer entertaining and relish in the opportunity to enjoy a causal dining experience outside with the family so today I’ll be focusing on sharing a few tips on Simple Patio Entertaining For Two, plus a few things I’ve picked up to help me in my endeavor. It’s already in the 90’s here in Houston so the options are very light, but festive! Affiliate links used in this post. Please read our full disclosure policy here. 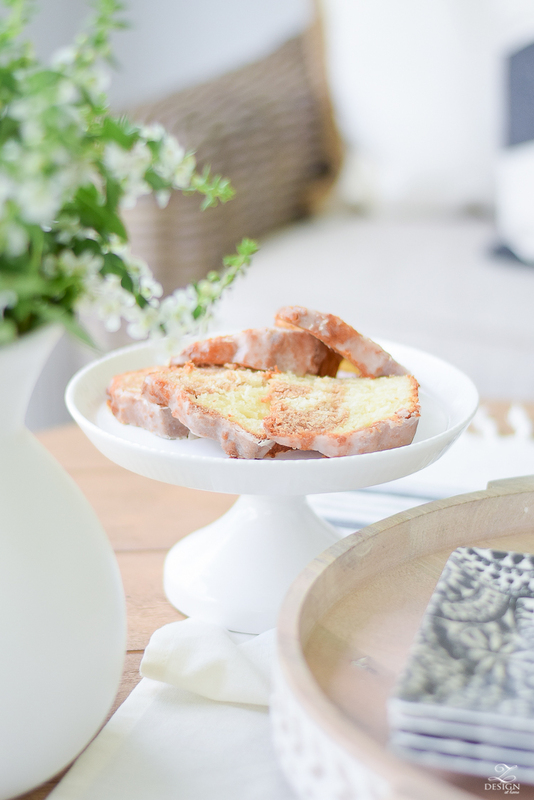 With the heat here in Houston we can only sit outside early in the morning or late in the evening so usually we’re having something simple like coffee cake or the like. I’m sure you noticed this post is for two but somehow our little man always seems to end up outside with us, even when we are trying to capture a moment alone so there are more than 2 plates here… of course that 3rd one being for him:). 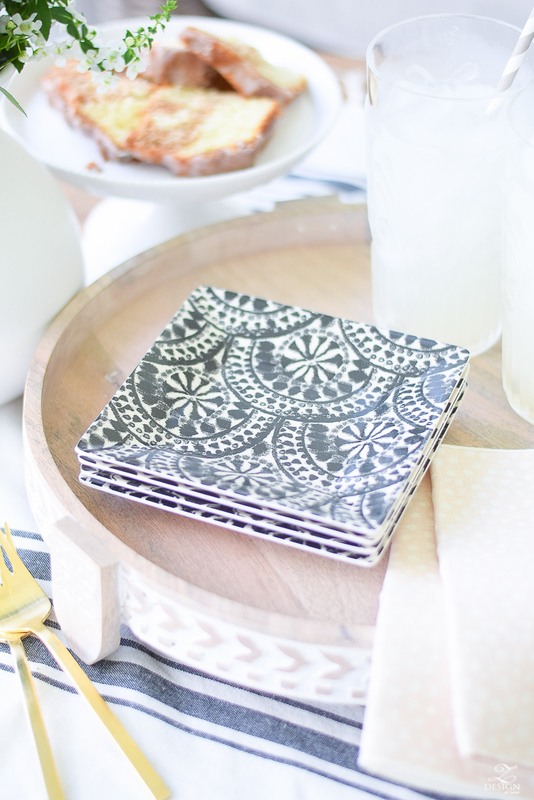 Love this black and white patterned plate set I picked up for outdoor entertaining this year. We lost just about everything in the Harvey flood last year so I am still in the process of replacing things. Just because you are outside doesn’t mean you can’t use linen, right? 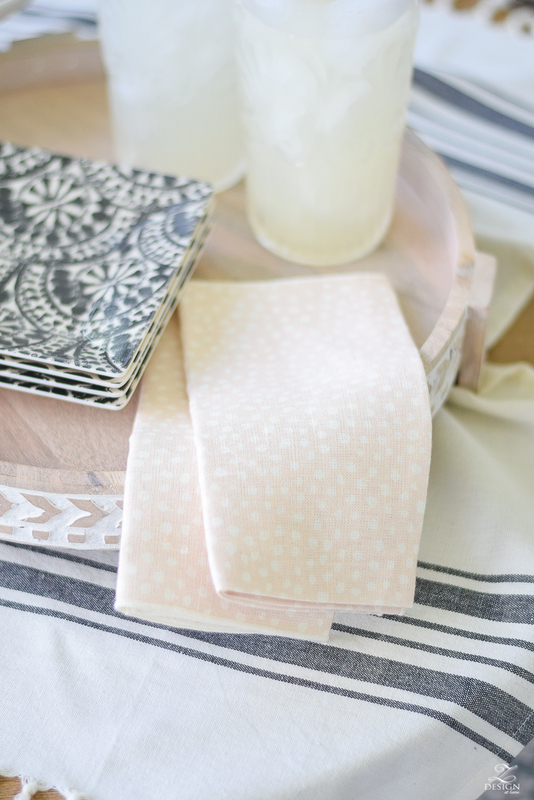 I pulled out some favorite simple, blush napkins that blended well with my setting here. Love linen anywhere, anytime (especially in blush)! I also showcased these in my Fake It, Don’t Bake It Tour last year if you missed it?! I also believe just because you are entertaining outside doesn’t mean you have to use plastic utensils so I’m using my favorite gold flatware out here too this year. Don’t ever be afraid to step out of that box that says you have to be super casual just because you are entertaining outside! 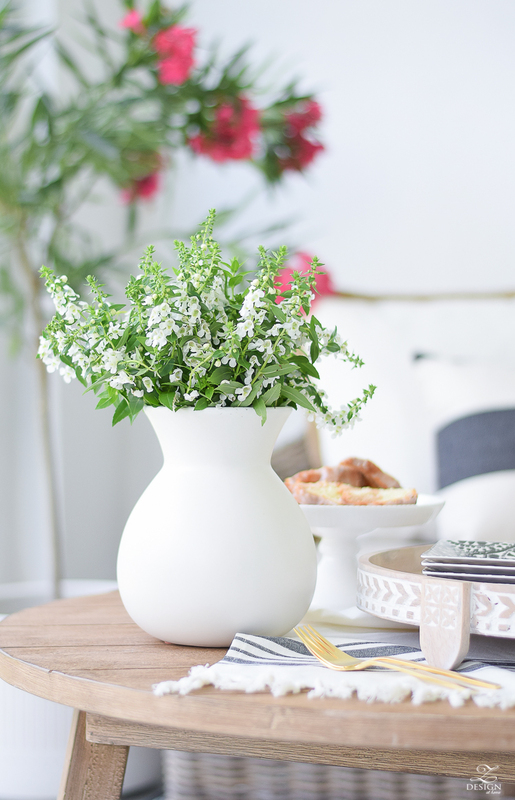 A favorite white bubble vase with a potted flower makes for a nice centerpiece on my small outdoor table. 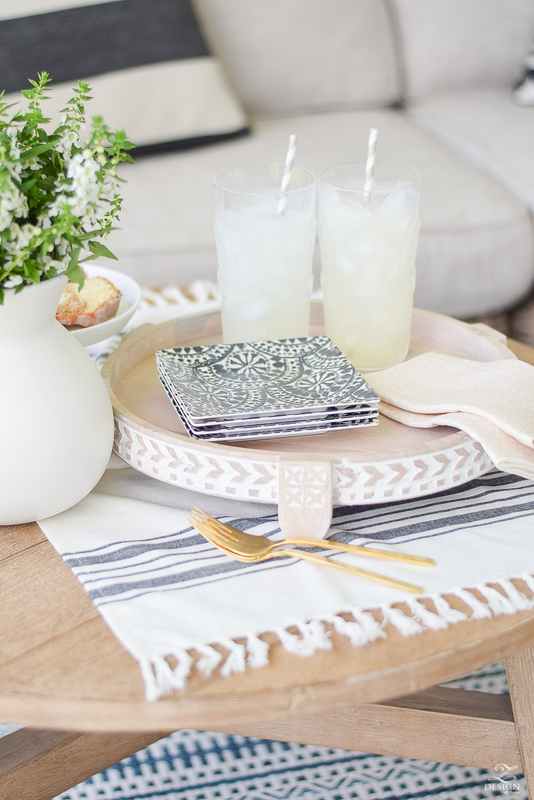 I picked up this fabulous white washed footed tray to use indoors and out and couldn’t love it more! 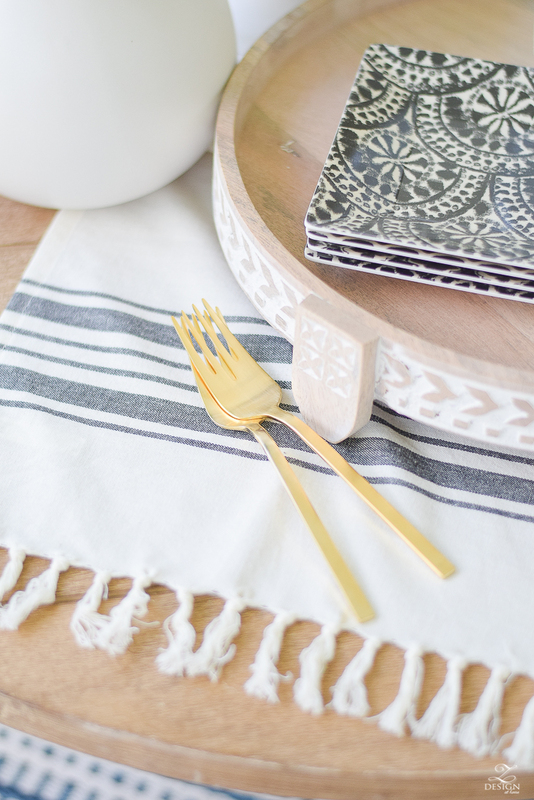 For effect, I placed it atop a favorite fringe dishtowel and then layered my dishes on top. I’ll be able to use the tray for lots of entertaining this summer and year round. I wish you could see these darling glasses in person (and without a beverage in them!). 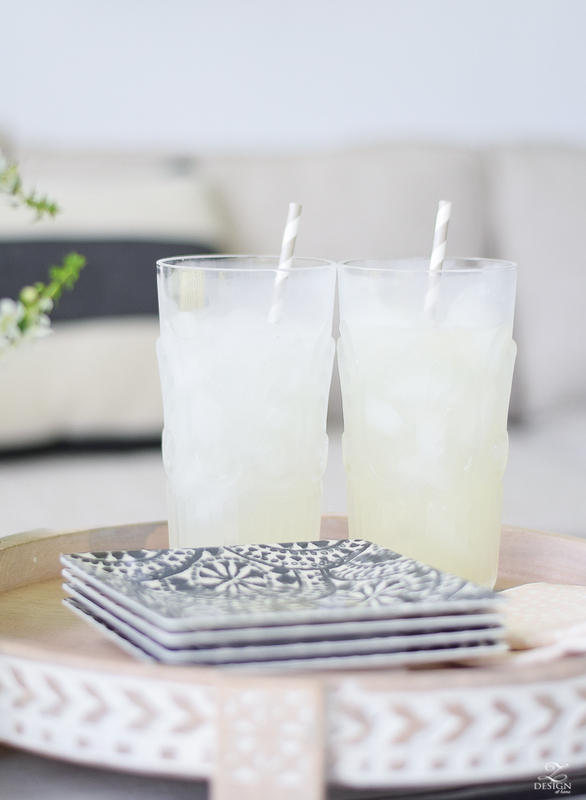 The cold, fresh lemonade was fabulous but causes you to miss the pattern on these darling patterend outdoor highball glasses. 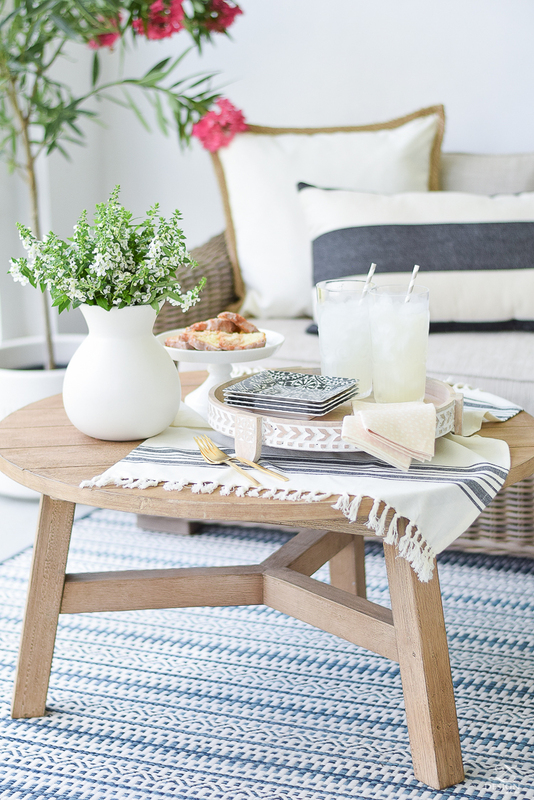 It’s super simple but super practical for outdoor entertaining for two. 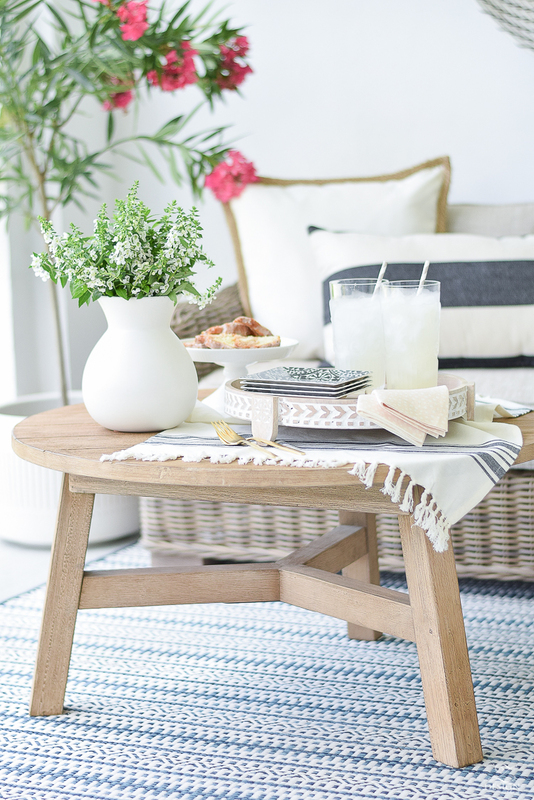 With Memorial Day Weekend literally right around the corner I hope some of these tips can help you to create a simple but cozy outdoor entertaining arrangement for you and that special someone. In warmer climates keep it light with pastries or a delicious homemade bread. 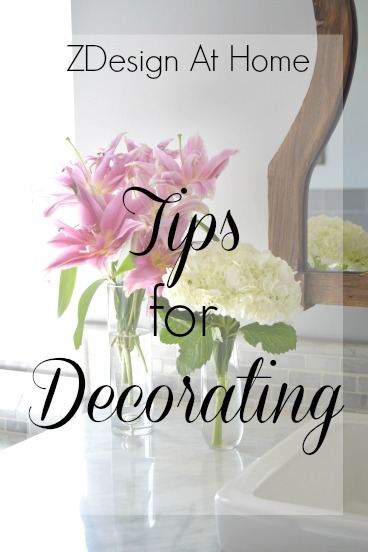 Always, always add flowers but a potted flower or plant adds interest and uniqueness to your table, not to mention color and texture. 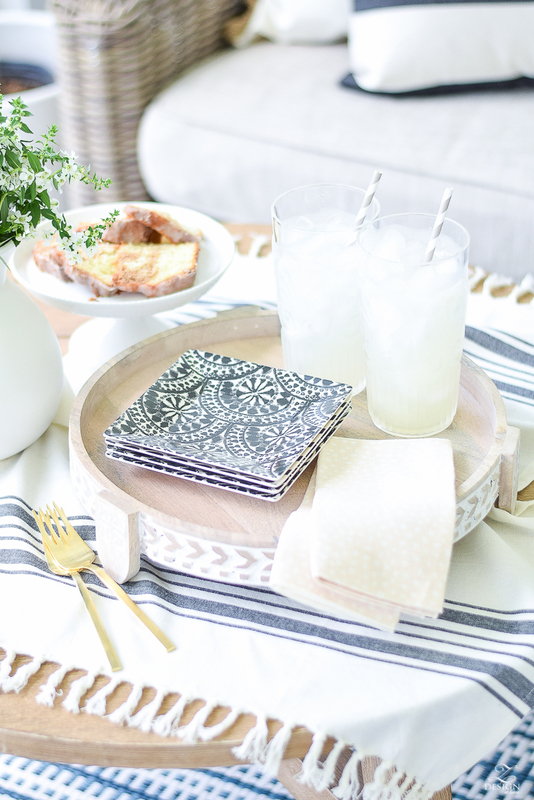 Use a tray to corral and elevate your pretty dishes to make them centerstage in your outdoor entertaining setting. I hope you’ve enjoyed my tips for Simple Patio Entertaining For Two for the Styled + Set Entertaining Tour – Summer 2018 and that you will stop by to see my friend Yvonne of Stone Gable Blog next. After that make sure also to visit the other participating bloggers listed below!! Let’s stay in touch! Sign up to become a weekly blog insider below! 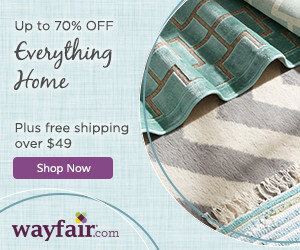 Shop all of my outdoor favorites here! Bree, this is such a beautiful summery setting for spending time with your loves. I love that you plan to spend time out there with the two of you, but your little man joins in the fun, not to be left out! You have such a talent for creating beauty in your world, for the people you love best. I wish you a beautiful summer, and lots of early mornings and evenings enjoying your patio. It’s always such a joy being on this tour with you!